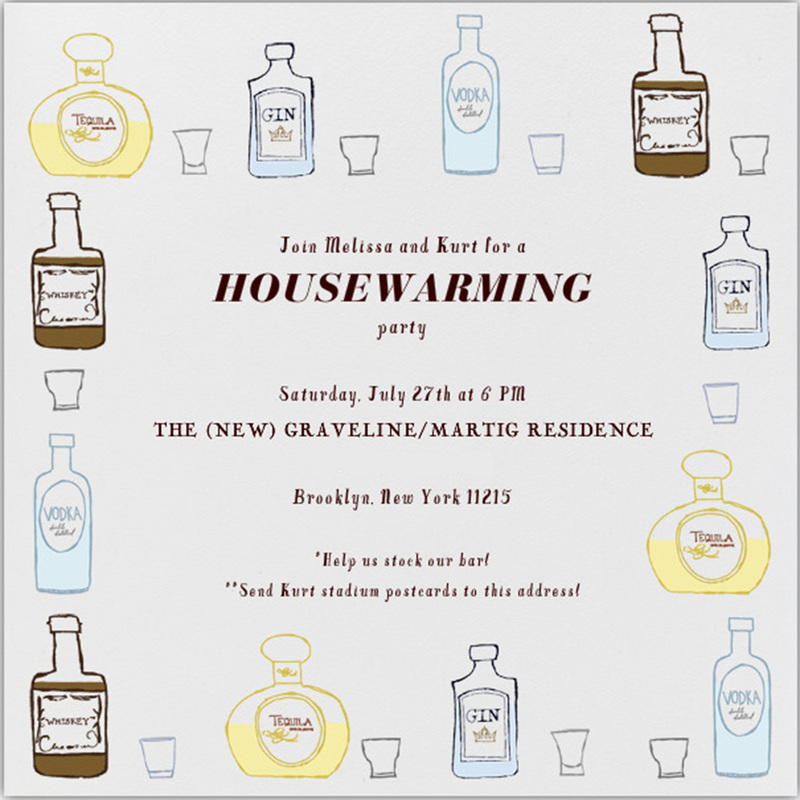 Onboard the Gravytrain: happy house warming weekend! Kurt and I are finally getting around to having people over to our new(ish) apartment this weekend for a housewarming party. Our place is nowhere near "done" (don't think it ever will be) but is leaning towards the direction of presentable once I give it a good straightening (i.e. shoving clutter in closets). I put the invitation and guest list together through Paperless Post (so many cute options!). We're shamelessly asking our friends to help us stock our fledgling bar with booze and mixers. I'm excited to learn how to make lots of cocktails! Please send me recipes of your favorite concoctions. For the party, we're planning on serving beer, wine, and an assortment of bruschetta which I'm pretty excited about putting together. I hope we have space to house all these people (remember? it's pretty small)! Overflow will be the building lobby and the front stoop. Great way to meet our new neighbors, right?! I hope you all have a weekend filled with friends and fun as well! Send some good party vibes our way! Have so much fun at your housewarming! Love the invites. Lately I'm really into making Pimm's Palmers for all my friends & I - it's just an Arnold Palmer (half lemonade/half iced tea) with some Pimm's cup (as much as you want, it's not too strong), a tiny splash of lemon or lime seltzer and a fun striped straw. So summery. Have a great time! Yay! Happy housewarming! Wishing you the happiest fiesta!